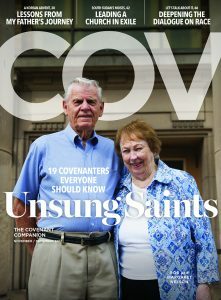 CHICAGO, IL (November 13, 2017) — The COV Sparks downloadable discussion guide for the November/December issue of The Covenant Companion is now available. 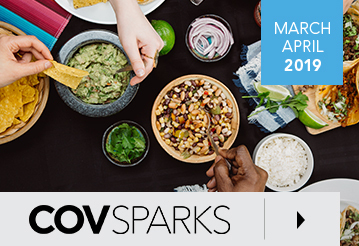 Based on articles from the current issue of the magazine, COV Sparks provides stimulating questions for Sunday-school classes, small-group discussions, and personal reflection. We asked readers to nominate members of their congregations whose ministry is unsung but make a big impact through their service. We received nominations that reflected the Covenant as a whole—you will be inspired by their stories. Two Covenant pastors share their thoughts on the issue of race and the church against the backdrop of heightened cultural and political tensions in our nation. Peter Ahn, who is Korean American, is senior pastor of Metro Community Church in Englewood, New Jersey, and Alex Gee, who is African American, is senior pastor of Fountain of Life Covenant Church in Madison, Wisconsin. It was on December 4, 1950, that her grandfather, father, and uncle risked their lives as they fled from Pyongyang to Seoul during the Korean War. Christmas is always a reminder that Joseph, Mary, and Jesus had to flee for their lives and that suffering is as much a part of the Christmas story as is celebration. The Light of the world came at night. He still comes to us in the shadows of our fears and failures. Stan Friedman is the news and online editor for the Covenant Companion and is grateful for the opportunity to serve in a job that combines his newspaper and pastoral ministry experience. He has been to 15 Bruce Springsteen concerts in four cities and listened to “Thunder Road” an average of at least once a day for 41 years.